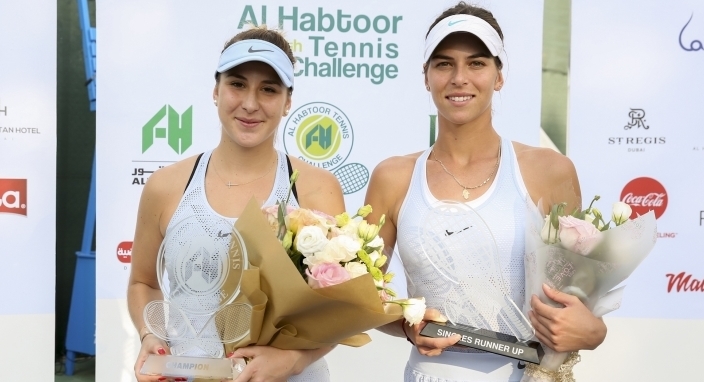 Ajla Tomljanovic admits it's "the worst feeling" having to retire from a final but the Croatian still managed to give a classy runner-up speech, paying tribute to Belinda Bencic, who defeated her to claim the Al Habtoor Tennis Challenge title in Dubai on Saturday. Tomljanovic retired while down 4-6 in the Dubai final due to a groin injury she picked up at the end of her semi-final the previous day. "I just felt my groin in the previous match, like two points before the finish," the 24-year-old told Sport360. "It was a sharp pain. I thought today, sleeping through the night and kind of letting it recover it would be okay but it just kept getting worse the longer it was going on. "And yeah, against a player like Belinda you have to be fully ready to run and play and when you’re kind of thinking about, that you’re hurting and stuff, it’s tough to play. I hate retiring, even more in the finals, it’s probably the worst feeling but it is what it is." Tomljanovic started her season end of February, unranked, following a 13-month hiatus due to shoulder injury, and will now rise to 118 in the world when the new rankings are released on Monday. "Looking back I’m pretty proud of how far I’ve come with my game, mentally, I think I’ve set up a pretty good base for next year," she added. During her runner-up speech, Tomljanovic apologised to the fans for retiring, and congratulated Bencic on her impressive comeback with the Swiss also spending several months sidelines this year due to wrist surgery. "First I just want to apologise for not finishing the match, trust me I probably feel worse than all of you," said Tomljanovic, addressing the crowd. "But I just want to congratulate Belinda and her team on a great couple weeks and just her overall comeback, I thought it was pretty impressive. She's on a what? 15-match winning streak? And thanks for saying that in the warm-up," she jokingly told the tournament director. "Like that made me feel great." Tomljanovic will begin her 2018 season in Brisbane followed by the Australian Open.